No more digging in your bag for keys. 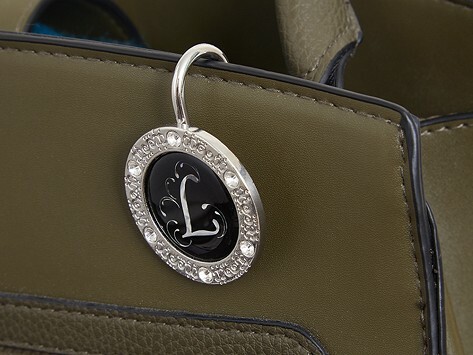 This purse key hook lives on your keys so you can hang them on a handbag in the best easy-to-reach spot. Now keys are made accessible on the inside of the bag and all you see on the outside is the monogram design of the hook. How easy is that? Dimensions: 3.5" x 1.25" x 1"
Finders Key Purse Maker Sandy Stein received the answer to the eternal question “Where are my keys?” in a dream. She was determined to see it come true, so she devoted herself to creating the simple-but-smart accessory that eliminates digging around in your bag for keys. Keys live on the hook and the hook sits on a handbag in a perfectly easy-to-reach spot. While keys hang inside, a design faces outward, adding a little accent to a bag. Going bag-free? It can work on a pocket or belt, too.